Much of the recent focus of the gas industry in Europe has been on large gas projects such as the Nabucco, South Stream and the Turkish stream gas pipelines. However, a number of less high profile developments have taken place over the last three years in Central and Eastern Europe (CEE) and these are likely to have a more profound and long-lasting effect on the region’s gas markets. These developments have increased the flexibility of gas flows across the region, reducing dependence on Russian gas and causing the price differentials between countries to narrow. Gas prices in the Czech Republic and Slovakia have already converged to German gas hub prices and this trend is expected to continue once the necessary infrastructure is installed and individual markets open up. In the meantime, European hub prices and the price of LNG in the Atlantic basin will increasingly be used as a ceiling for the price of Russian gas imports into Eastern Europe. Although much of the recent focus of the gas pipeline industry has been on large gas projects such as the Nabucco, South Stream and the Turkish stream gas pipelines, a number of less high profile, but much more revolutionary developments have taken place over the last three years in Central and Eastern Europe (CEE). These developments have been prompted by security of supply concerns (the region is largely dependent on a single source of gas, from Russia), concerns which have been heightened by the cancellation of South Stream by Gazprom and the conflict between Ukraine and Russia. European Commission stress tests have identified missing infrastructure links and long-term supply contracts to a single supplier as the principal causes of the region’s energy insecurity. In response, the Commission and 15 CEE countries have created a regional priority infrastructure roadmap and signed a Memorandum of Understanding to develop missing gas infrastructure and thus enhance the diversification of gas supplies to the region. Work on enhancing gas pipeline interconnections and reversing flows has been underway for a number of years - principally since 2009, following Russia’s decision to cut supplies to the Ukraine creating major gas shortages. Nearly all existing transit pipelines can now handle reverse flows, enabling much greater flexibility in deliveries compared to just two years ago. 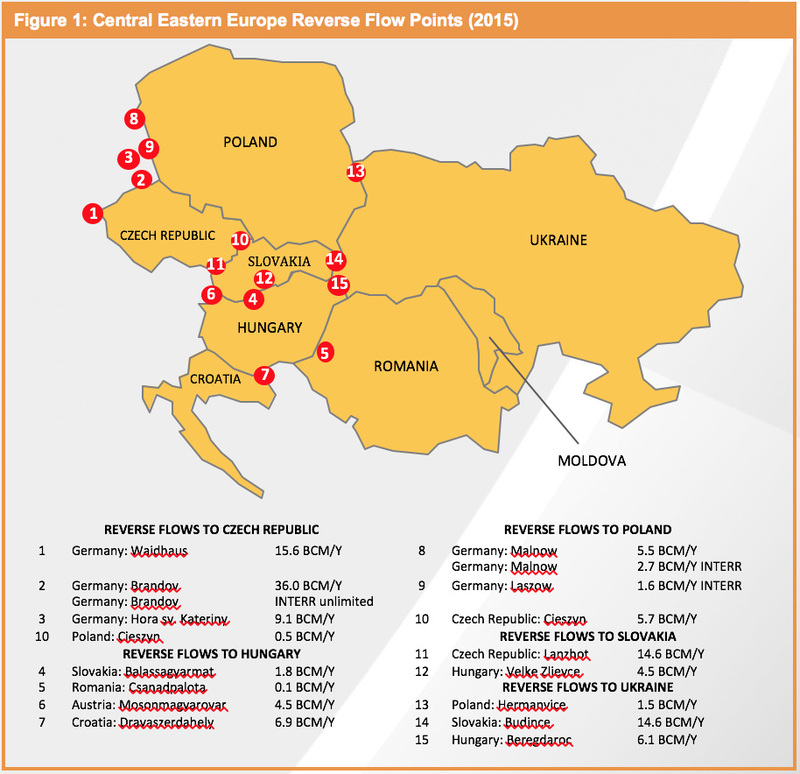 The total CEE reverse flow capacity now stands at about 147 bcm/year, while a further 42 bcm/year of new interconnection capacity has been added within Eastern Europe and between Central and Western Europe over the last five years. In August 2014, Eustream rehabilitated a disused pipeline allowing it to export up to 14.6 bcm/year of gas to the Ukraine. 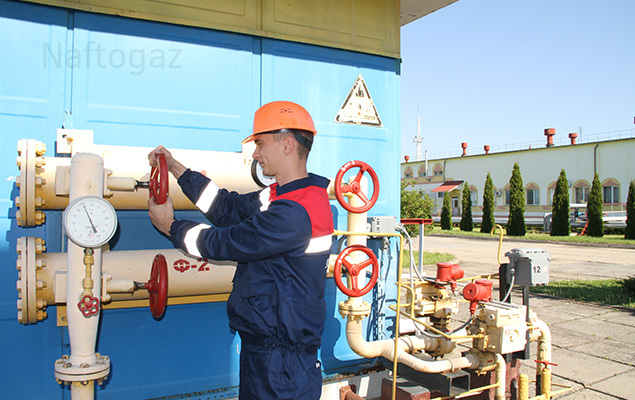 Slovakia has become the main gas trading hub in the region as a result of these developments. However, Poland is now keen not to miss out on the new business opportunities and plans to increase its ability to transport gas eastwards. 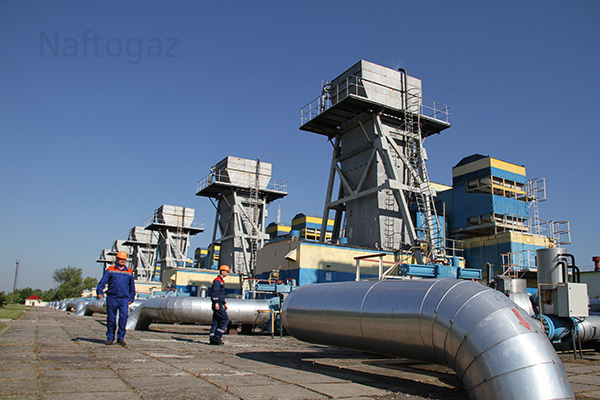 In December 2014, Polish GAZ-SYSTEM and Ukrtransgaz signed an agreement to develop a new cross-border bi-directional pipeline with capacity of 8 bcm/year from Poland to Ukraine and 7 bcm/year from Ukraine to Poland. In future this could allow Ukraine to import gas via the proposed Polish LNG terminal in Świnoujście and should serve as a hub for balancing, storing and redistributing gas between Ukraine and Poland. In an attempt to reduce its dependence on Russian gas, Ukraine signed an agreement with Slovakia in April 2014 to allow EU states to deliver gas to Ukraine through Slovakia. This has strengthened Ukraine’s negotiating position with Russia and has already affected gas import prices as deliveries from the West have proved to be cheaper than Russian gas delivered directly from Russia. For example, Naftogaz reported that Ukraine paid $322.5/ thousand cubic meters (tcm) for gas from Europe against an average of $335.7/tcm for gas from Russia in January 2015. The signing of the agreement between Ukraine and Slovakia instigated a sharp fall in gas deliveries from Russia to Slovakia (both for Slovak domestic consumption and transit to Austria and south east Europe) in the second half of 2014 – they remained significantly below previous volumes in the first quarter of 2015 but then recovered in the second quarter of 2015 compared to 2013 levels (see Figure 3 below). However, as Ukraine suspended Russian imports in July 2015, the second half of this year is likely to replicate the trend experienced in the second half of 2014. Net4Gas and Eustream, the Czech and Slovak transmission system operators, lost a large proportion of their core transit business when deliveries of Russian gas to Germany and France were diverted via the Nord Stream in November 2011 (44 bcm/year of Russian gas used to flow from East to West through the Brotherhood pipeline just five years ago). However, they have since acted to exploit new business opportunities presented by these changes. Net4Gas now transports some gas through its Gazelle pipeline from Nord Stream to Germany. However, the greatest boost to its business has come from increased flows from the West to Slovakia and Ukraine through the Brotherhood reverse flow pipeline. Further, since the take-or-pay clause was removed from the Czech contract with Gazprom, the Czech Republic is largely importing gas for its own needs from German hubs or from Norway, further boosting West to East gas flows. Poland may have been a laggard in adopting the EU Energy Directive but the connectivity of its gas network has increased significantly in recent years. The Polish transport operator, GAZ-SYSTEM, has established interconnections with the gas systems in Germany, the Czech Republic, Slovakia and Lithuania. It can now import up to 5.5 bcm/year of natural gas from Germany using virtual reversal on the Yamal gas pipeline; along with a further 2.7 bcm/year of gas due to interruptible capacity being offered at the Mallnow reversal. These changes mean that the country can now import over 90% of its natural gas import needs from the West and the South. GAZ-SYSTEM is also the owner of Polskie LNG which was established to construct the LNG terminal in Świnoujście – it is expected that this will now fully come on stream in 2017. The company has announced ambitious plans for the period to 2023 – it is planning to increase the capacity of existing connections to Germany, the Czech Republic and Slovakia, to build new connections to Lithuania and Denmark, and to construct some 2,000 km of new gas pipelines in the western, southern and eastern parts of the country. Although some of the more costly projects are unlikely to go ahead, the building of smaller connections will certainly enhance flexibility. The Hungarian transmission company FGSZ has likewise been constructing new pipelines and reverse flows to Croatia, Romania, Ukraine and Slovakia. In June 2011 a 6.9 bcm/year capacity pipeline between Hungary and Croatia was completed; in April 2013, Hungary completed the reverse flow on a pipeline to the Ukraine (with a capacity of 6.1 bcm/year); in February 2014, the first stage of a bi-directional pipeline between Arad and Szeged in Romania was completed; while in July 2015 a new pipeline connecting Slovakia and Hungary was also completed – the pipeline has a capacity of 4.5 bcm/year from Slovakia to Hungary and 1.8 bcm/year in reverse. FGSZ is also planning new connections to Slovenia and Austria, both of which will be bi-directional and should be completed by 2017. Gas in the Ukraine may have attracted most attention, but the changes to networks elsewhere in the region (and the flexibility that this has provided) are likely to have a more profound and long-lasting effect on gas markets, in particular in that the previous dependence on Russian gas supplies will diminish. This is already having an effect on gas prices which have been moving towards the levels set by European gas hubs. Gas prices in CEE countries have tended to be set by each country’s relative dependence on Russian gas, as dictated by the existing infrastructure and the relative state of their political relations with Moscow. As a result, gas prices have tended to be higher in countries further east. However, the new infrastructure is causing the price differentials between countries to narrow. Gas prices in the Czech Republic and Slovakia have already converged to German gas hub prices – this trend is expected to be seen in the rest of the region once the necessary infrastructure is installed and individual markets open up. Ironically, Russia’s rerouting of its gas exports through Nord Stream has created a commercial rationale for the use of West to East and North to South gas supply infrastructure in Eastern Europe. Moreover, with local gas companies expected to extract themselves from long-term supply contracts for at least a part of their imports, these volumes will more and more be driven by purely commercial considerations. Slower progress in gas market liberalization and the dominant position of incumbents in some of the CEE countries may slow this process, but the gate has now been opened to gas-to-gas competition in CEE, despite the fact that much of the new flows are re-routed Russian gas. Nevertheless, even before the region achieves full connectivity, both European hub prices and the price of LNG in the Atlantic basin will increasingly be used as a ceiling for the price of Russian gas imports into Eastern Europe. Zuzana Princova is a Gas Market Specialist in Oil, Gas & LNG Team of IPA Advisory Limited. She has specialised in the natural gas industry for last 23 years. She has gained extensive international experience providing commercial and strategic advice on market developments, regulation and price, with a special focus on Central and Eastern Europe, Russia and CIS. Zuzana has worked on various projects ranging from market analysis, assessment and forecasting of gas supply and demand, strategic studies, due diligence on resource development projects reviews and market assessments for large international oil and gas companies, national gas companies, and public, private and institutional bodies. She has worked as an expert witness in international arbitration cases and with her insight into the geopolitics of these countries she has been able to provide analysis and scenarios for industry entrants and investors. Zuzana holds a MA (Hons) in Economics from the Prague School of Economics and BA from Birkbeck College, University of London. This article was first published as an IPA Industry Insight in September 2015. It is republished here with permission. Inquiries: Colin Harrison, Head of Oil, Gas & LNG at colin.harrison@ipaadvisory.co.uk and Zuzana Princova, Gas Market Specialist at zuzana.princova@ipaadvisory.co.uk.